As the demand for higher bandwidth for virtualization, faster backup/restore, and the exponential growth rate for data in business increases, the need for a 10 GbE network becomes essential. The deployment cost for a 10 GbE infrastructure is becoming more affordable, and the time for businesses with performance demanding applications to transition into this technology is now. The Turbo NAS has an optional 10GbE network card which can be used to fulfill the most demanding applications requiring a high bandwidth. 10GbE has the highest data transfer rate, acheiving ten times faster than the standard GbE. Application and processing requirements constantly evolve heightening the need for higher performance storage. 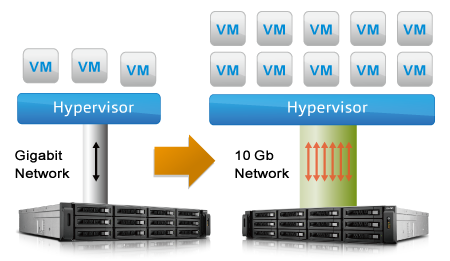 Especially with virtualization of IT resources the need for high performance storage is essential. 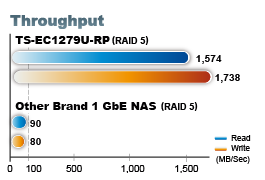 The Turbo NAS offers class leading hardware matched with unparalleled 10Gb speed for all the virtualization needs. The 10Gb speed will increase the agility of data transmission in a virtualized environment intensifying NFS and iSCSI connection performance. The 10GbE connections will reduce backup time & enhance business productivity! The 10GbE Turbo NAS supports SMB/CIFS, NFS, and AFP protocols for file sharing across Windows, Mac, Linux/UNIX networks. User accounts and shared folders can becreated via the user-friendly web-based interface without IT expertise. The 10GbE Turbo NAS is a quick and complete backup solution that offers extreme high performance storage to meet the needs of small or medium-sized businesses looking to quickly and centralize data management while safeguarding their data from unauthorized users. 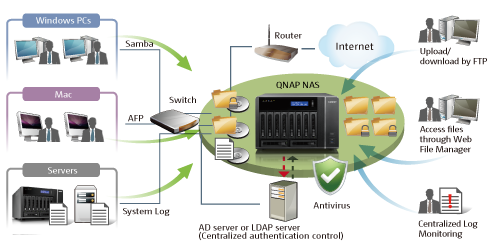 With powerful applications such as the QNAP NetBak backup station, information can be automatically transferred from Windows PC to the TurboNAS instantly or scheduled. The Turbo NAS is even an ideal storage for the Apple Time Machine. Many IT companies may already use third party software,and an array of backup software such as Acronis True image and Symantec Backup Exec is supported. Digital film and video production produces volumes of data that require high performance RAID storage with sustainable throughput to balance with the demanding output of video editing. The Turbo NAS fulfills storage and video editing needs with a high-speed 10GbE network interface. Digital videos can be quickly stored and edited on the Turbo NAS directly over the network. The Turbo NAS supports various network file sharing protocols such as NFS, AFP, and SMB/CIFS, so sharing files among PCs with different operating system is easy. The scalable design of the Turbo NAS allows for the capacity to be expanded on the fly so the Turbo NAS can grow as the business data does. 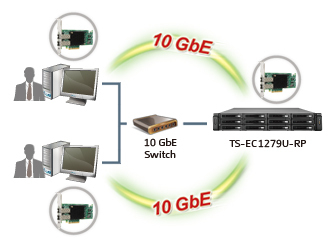 There are multiple physical interfaces of 10Gbps Ethernet to choose from. The SFP+ is the most popular one for now,and both SFP+ and 10GBase-T will be the industry standard in the near future. 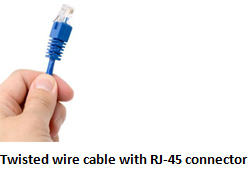 Direct attach copper (DAC) cable is a copper interconnect using a passive twin-ax cable assembly that connects directly into an SFP+ housing. It has a range of 10 meters which is low power, low cost and low latency with the added advantage of having the small form factor of SFP+, and smaller, more flexible cabling. 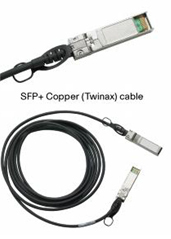 The active twin-ax cable has active electronic components in the SFP+ housing to improve the signal quality; the passive twin-ax cable is a simple straight "wire" with no active components. The theoretical maximum cable length of active DAC can reach 10 meter. SFP+ DAC cable can be purchase from a third party vendor as long as it is compatible with solution card. If used to connect the NAS to a 10GbE switch, some switch vendors have encryption implemented on their 10GbE interface. Therefore if to connect the NIC or NAS to their switch, only proprietary cable can be used. Cables that are SFF8431 compliant can be used on most systems. However some manufacturers use encryption so that their cable must be used with their products. SFP+ OPTIC adapter using enhanced small form factor pluggable (SFP+) short range (SR) transceivers connect to network using optic cables. Fiber Optic cables are designed to reach long distance without losing signal. 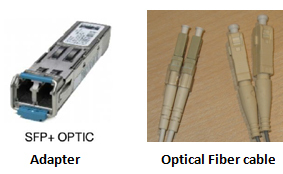 SFP+ OPTIC come in a variety of types to drive signals across fiber optic cables with different maximum distances. The most common, and lowest in cost, is 10GBase-SR (SR, or short reach),the Maximum cable length for SPF+ (SR) is 300 meters over multi-mode Optical fiber. Over Single-mode optical Fiber can reach up to 80km. The 10GBase-T is to provide 10 Gbit/s connections for both over unshielded or shielded twisted pair cables to distances up to 100 meters (330 ft).The 10GBASE-T has higher latency and consumes more power than other 10GbE physical layers. The 10GBASE-T silicon is available from several manufacturers with claimed power dissipation of 6W and a latency approaching 1 microsecond. The advantages of the 10GBase-T is longer distance, familiarity with RJ45 connectors, and backward compatibility, but the latency, cost and less stability deters the cable from reaching a sweet point.